As Promised here are some shots of Danebo. 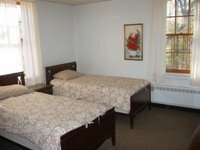 Beautiful sun filled rooms with brand new beds and mattresses. All from Ikea – keeping with the Scandinavian theme. Who knew a mattress from Ikea was sooo comfortable? The decor is all typical Scandinavian. Beautiful lace curtains, Danish embroidery framed on the walls, even the retreat participants were mostly Scandinavian. The group was compiled of our Monday knitter’s group at Ingebretsen’s and another group who have been knitting together for twenty years. I also convinced my Mom to come along for a much needed respite. It was so nice to have some time with just the two of us. It was good for her to have some time to relax and more importantly create. Two of our members wanted to make the weekend’s meals. Yum! It’s hard to say what my favorite meal was – a tie between the open faced sandwich lunch and the Swedish meatballs. Most of the food came from Ingebretsen’s – this is the first time I had their famous meatball mix (folks line up on Lake St during the holiday season just to get into the butcher shop for this stuff) – I have to say it was good but I still like my Mom’s better. The other attendees were a blast! They all were working on beautiful ski sweaters. Most of the sweaters were made without patterns – only from their experienced years of knitting these sweaters. 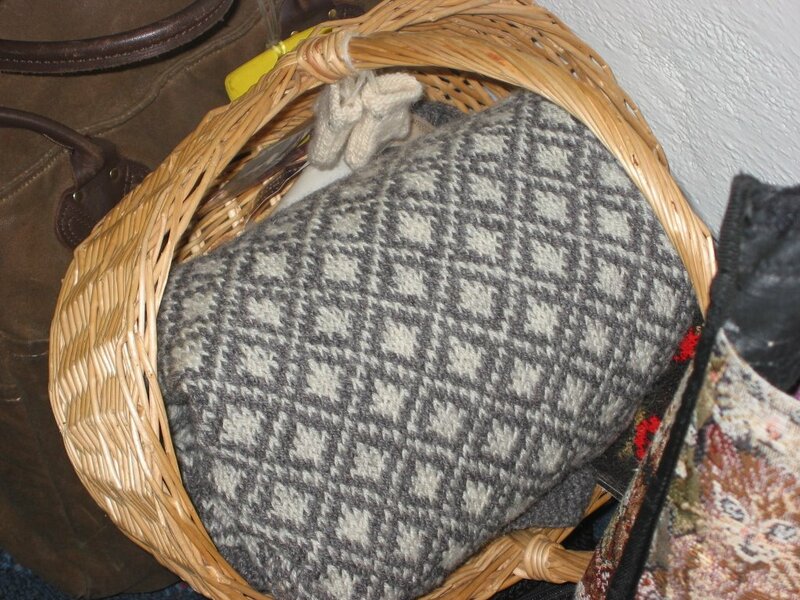 They found most of their pattern motif inspiration from the Swedish Mitten Book. 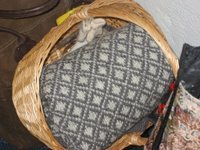 I took a picture of Shirley’s knitting basket and her gorgeous sweater. This sweater is knit in Rauma, entirely in the round with a beautiful 4 stitch strip of the light grey for the impending steeking. I’ve decided I’m a little contact high off these sweaters and need to make one of these. Incidentally, I tried on some sweaters at Ingebretsen’s on Monday and actually had the , “Well, I could make that” comment breeze through my head. I must be high. The whole weekend was so fun. We all chatted and laughed a lot and did a bit of knitting. In my mother’s case it was crochet. Why is it that the crocheter’s of the world have a red headed stepchild mentality about their chosen craft? I convinced her the knitter’s would not revolt at the site of her crocheting but would instead welcome it. Boy was I right! Saturday was what animal is Cinda making day. My mom makes a crochet sheep that is basically a large ball for the body and a small ball for the head with a few appendages. 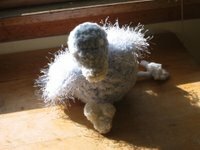 The intent was to make another sheep – this time in baby blue for a co-worker who is pregnant. Some how after she had attached the snout the sheep looked more like a duck. So after much discussion, and many laughs, my mother broke free of her chain, no pun intended, and crocheted without pattern. Everyone had suggestions for what this shape could be, a chicken, a moose, a flamingo, a penguin, a cow. She settled on a birdie. I’m not a huge fan of eyelash but the use of it on the wings is just perfect. I helped create the i- cord legs. Adorable, no? After she dropped me off on Sunday she called to say she had found the perfect color of yellow eyelash for a chicken, and to ask what size needles she would need if she were to make i-cord. Ha! My master plan is working! I think she may start doing some knitting. I’m sure there’s going to be a barnyard of animals! 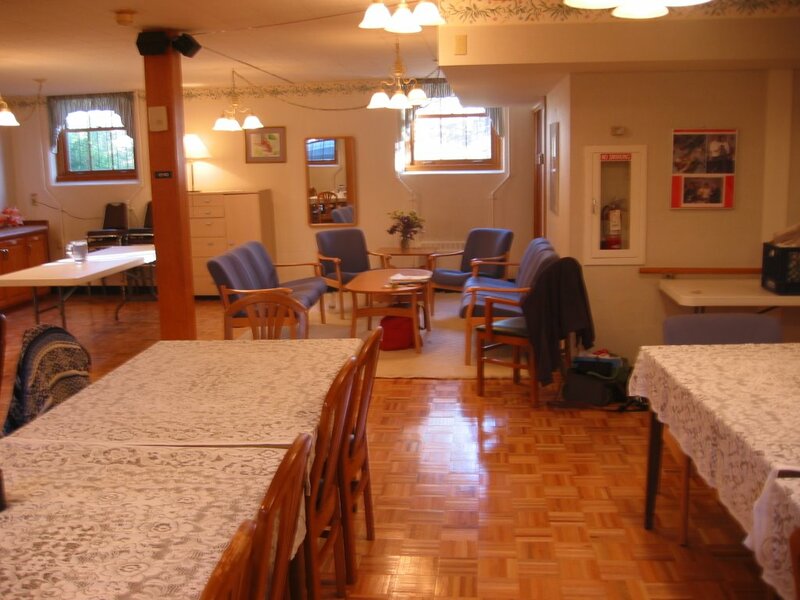 It sounds like the ladies are up for another retreat next year at the same time and possibly another in the spring. It was everything I’d hoped for. I’m still basking in the glow of my perfect Scandinavian weekend. This entry was posted in Uncategorized on October 19, 2006 by Jennie.